Normally, I like to recount my successes here on the blog, but sometimes, honesty is best, too. I've been running a book club for 8-12 year olds at my library and attendance has been low(ish) but not abysmal. It's definitely not an easy sell, not like adding another baby or toddler storytime, which would fill up in no time, that's for sure. I have about a half-dozen kids who've been showing up on a somewhat regular basis. Generally, we read a book, and do a craft while we have a light-hearted, informal, no-quizzes-later, kind of chat about the book. Our Diary of a Wimpy Kid book club meeting last month probably drew the largest crowd yet. I've been hosting them on the first Friday of the month in the late afternoons - mainly because there's been a lot of requests for activities that aren't in the middle of the week. It's the beginning of the weekend, and "First Friday" is alliterative, and relatively easy to remember. A lot of the kids are pretty engaged, but with their busy schedules, they are a bit burnt-out on anything too "schoolish" so I really make an effort to keep things fun and low-pressure. When I was planning our line-up of book club meetings, like, 6 months ago, I completely forgot that the first Friday in March would be Dr. Seuss's birthday. 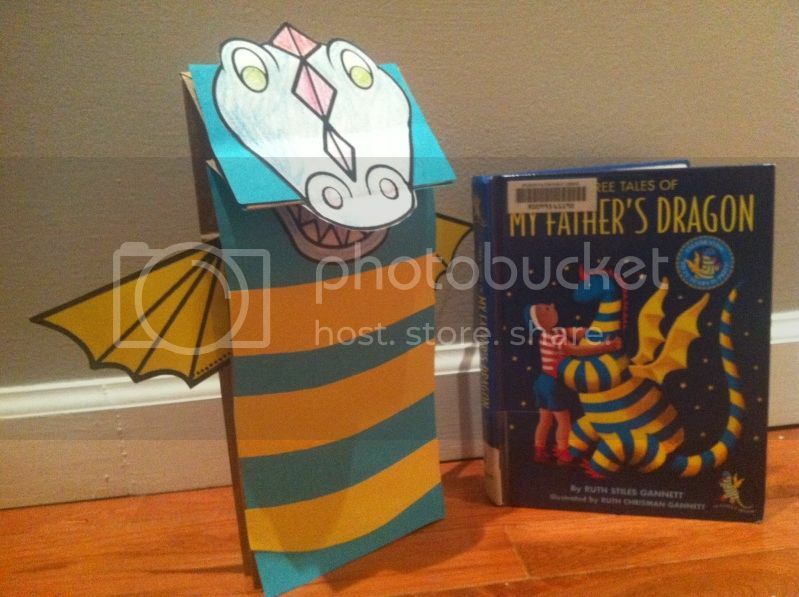 I planned for us to read My Father's Dragon by Ruth Stiles Gannett and make a dragon paper bag puppet. Voila! Gorgeous, right? I got the pattern from www.abcteach.com. They have a number of resources for free, or for $39.99 (less with a group membership!) you get access to all of their crafts and activities - well worth it, in my opinion. Their cute craft ideas are such a timesaver. The original pattern has a strange-looking belly for the dragon, but I nixed that in favor of the striped construction-paper belly I gave him. Sadly, my book club were no-shows! Why? Well, I think they simply had too many other competing activities yesterday, probably mostly having to do with the Seuss-sanity that's been brewing all this week. (Seuss-sanity, is that a word? It is now.) I did manage to press a few dragon-templates into the hands of kids at the branch who hadn't read the book, but might enjoy the craft anyway. Honestly, I think the low-attendance for this program had more to do with timing, than anything else. I'll definitely have to try to resurrect this program at some future (more auspicious) date. Love the craft project. So cute and simple. Thank you so much! This one was too good to waste. I'll definitely have to try it again sometime.